Lets start with the currency and work our way backward through a couple of charts to see if we can put this all to use. The US Dollar continues to exhibit a pattern of “lower highs” coupled with the current fundamentals (the printing of 85 billion new dollars per month) suggesting to me – further downside is certainly in the cards. A lower dollar leads to higher prices in our commodities market right? – which in turn puts pressure on bond prices and interest rates. 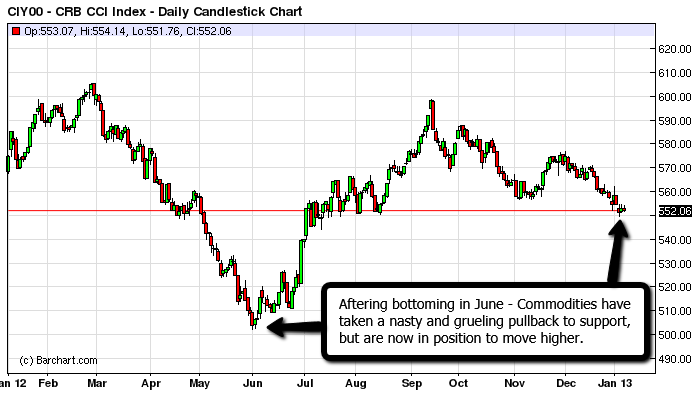 The entire commodities complex clearly bottomed in June, and has taken a nasty pullback to an extremely solid level of support. As the USD rolls over – we can expect higher prices in commodities. The $CRB after bottoming in June is now at support. 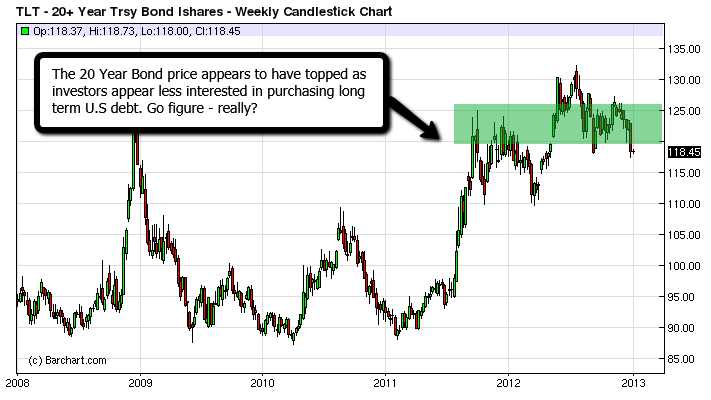 The symbol “TLT” tracks the price of the U.S 20 Year Bond. As the price for bonds falls the rate of interest paid rises (the price of a bond and its yield are inversely correlated). Lastly in this wonderful chain of events we look at the SP 500 (or futures symbol /ES) and see that if indeed the intermarket analysis holds any water – a falling dollar creates rising commodity costs, in turn leading to inflationary pressures pushing interest rates higher and bond prices lower – eventually spilling over ( as businesses begin to feel the pinch of higher borrowing costs) and lastly effecting equities. 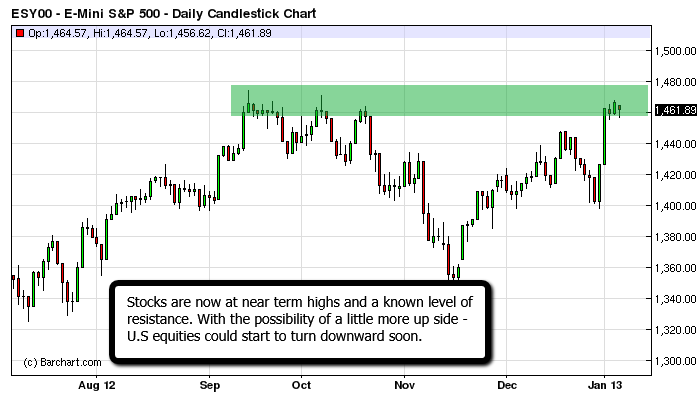 SP500 Futures are nearing levels of resistance. Now please keep in mind that these things don’t all happen “on the turn of a dime” – but all things considered it would appear that this is the scenario currently playing out in markets – as the dollar printing continues, commodity prices start to rise, bond prices turn lower (and interest rates higher) – and lastly we will see a reversal in equities. I am still sticking with the timeline of late Feb to early March where I envision the stock market to start making its turn, as we can clearly see that the chain of events unfolding is leading us in that direction – likely sooner than later. I don’t necessarily expect stocks to “crash” as we have to keep in mind that the FED will do anything in its power to keep prices elevated – but as the forces outlines above begin to take hold – “sideways to down” looks far more likely than any type of rocket to the moon. Chart and technicals aside, I’m curious as to why you think stocks will turn lower if you believe the US dollar will lose value and commodities will gain… shouldn’t stocks rise when the US dollar falls and commodities gain, as they usually do? ps. Luv the blog, it’s one of my daily stops now. Fantastic point – just great. A question for you? – “don’t you think U.S stocks have already risen?” – We are currently pushing at near ALL TIME HIGHS! The timing is always a little tricky when looking at “macro analysis” – as these things don’t all just “switch up on a dime”….so please be careful. Intermarket analysis on this large a time frame / level will not provide “trade signals” – but moreso a larger view to be aware of as you formulate your trading plans. In general “yes” a falling dollar should be indicative of higher stock prices – to a point. We’ve already seen the dollar fall considerabely since June – as commodities have risen inversely. As I suggested I expect further downside in the dollar..and further upside in commodities…but not neccesarily much further upside in stocks. I would imagine on the next “significant drop” in the USD – we will see a considerable “spike” in equities. But after that – the dollar will likely bounce hard and stocks fall. I do believe stocks have already risen plenty and are proving to be way more resilient than I ever imagined. Since the Russel index has recently made an all time high I can see the S&P and Dow following suit as the small caps usually tend to lead; with that said, there’s no way I’d go long right now as my bias is towards the downside. I see more strength in the dollar because of the debt ceiling (which is also why I’m biases towards the downside when it comes to stocks), once that has been resolved, I think it’ll be clear to short it against various currencies, ideally at way more comfortable levels, like if the AUD went back to parity for an example. It’s just hard to want to buy it at 1.05 right now in my opinon. You’ve got a fantastic bead on things David – and as you’ve outlined – stocks have been more resilient than ever imagined. In all – I share your views 100% and imagine you and I are only “one wave/squiggle” apart in our overall analysis. Hell – I’m as bearish as they come! All the same – my trading keeps me going in “said direction” until I see reasonable indication of otherwise so….85 billion a month outta the FED and steady uptrends abound – I will go with what I see, until I see something else! Great input David – thanks for the contribution here! Again…excellent point – and a really good arguement/area to learn from. More questions for you to consider: Do you think the current investment environment is in better shape than the last SP high of 2007? or worse? When looking at the big picture, all of these factors fall in there as well so – it’s never as cut and dry as “dollar down = stocks up”. Unfortunately we are so much worse off right now, which is why I’m in the Dow 10,000 camp instead of the 15,000 camp. It is sort of scary to think about what happens if things do not work out out though and financial markets begin to collapse again (Dow 5000?) as the government had already played its hand; if the government can no longer keep the markets propped up, low stock prices will likely be the least of our worries. With that said, it would be interesting to see a day when the dollar and stocks simultaneously trade higher again based off of a strong economy and fiscally responsible government. I am with you 100% – exactly. Things are going to get ungly..very, very ugly for the U.S moving forward. I think 10,000 is more than in the cards alot sooner than people may think. Again though – I can’t let my “bearish tendencies” sway me.If you want ton continue to make money in the markets you’ve got to leave the “opinions and emotions” on the sidelines, as I’ve learned the hard way. I will be thrilled to switch camps – when indeed the market shows me the time is right. Kong, Good post man,plain and simple for any novice to understand.Why the hell Gary isn’t willing to listen to what you are saying I just can’t understand and I can tell you are beyond FRUSRATED!! w/ him.There are other things that carry some predictive value and he just blows it off.I am looking and listening for any damn thing that can maybe give me a step up every minute of the day now.I will try to keep in touch more often as I will have more time in about a week,Have a good one buddy. Well….the poor fellow can keep playing with his “broken toys” and see how that works out. 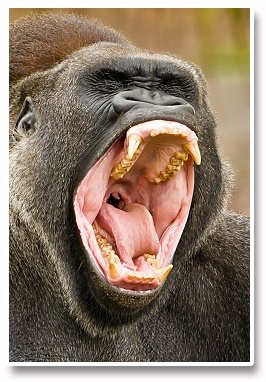 In any case – as I’ve said before, no Ill will on my end – but I imagine he’s hunched over a bunch of forex charts now! The guy doesn’t even factor Australia or Canada into analysis?? – as if the U.S is the center of it all – as opposed to the current world view of it being the brunt of some really big jokes. Again…thanks again Ronnie – always a a blast. Considering that, as well as my “full immersion” in currency trading – perhaps I forget / don’t consider what others are looking at in their day to day comings and goings. Im just a little ways “off the reservation” if you know what I mean. Investment wise – I do however, feel strongly that “this is the world we live in” so….one better get a handle on more than a couple of those moving parts – or run the risk of getting left in the dust. When tools aren’t working etc – perhaps it’s time to pick up a few new ones. I can’t sit a moment either – it’s just not in my nature. I guess that’s another reason I love foreign exchange, as the puzzle just continues day after day after day…..
I’m really not sure what I’d do if it was “easy”. Cheers Schmed and thanks again. Very cool Schmed – I will make a point of watching the trade. With the unprecedented easing on the part of the BOJ, Kong, the DXY is showing new strength. In turn, most commodities I track have stagnated. And I see precious metals have truly taken a thrashing. 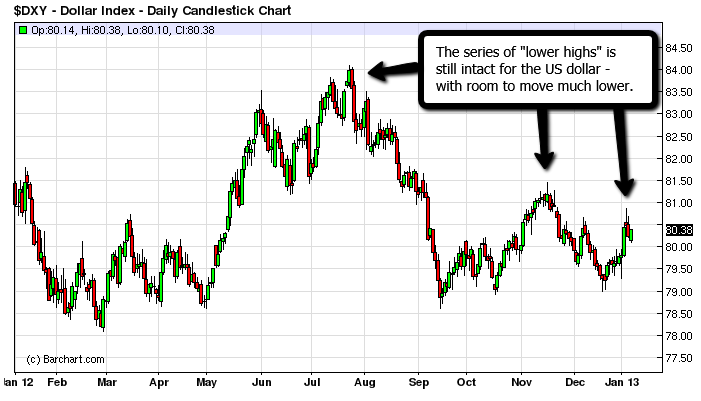 One would think with QE3 and QE4 the dollar would have backed down. To me it’s a puzzle. I am not a currency trader but tuning in here to ask what your prognosis is for the yen in the near term? I understand you live in Mexico. If there is one thing most Americans are misguided about it is Mexico, a land of beauty and, for the great part, wonderful people. So I will say ‘Gracias’ and look forward to hearing your outlook on the yen. Salud! Hi TW – thanks for stopping in – I appreciate your questions/comments. The initial reaction to BOJ’s new easing/policies to put in motion has been significant and very profitable – no question. Short term I see a touch further downside in YEN (maybe consider the round number of 90 in USD/JPY for example – only a 100 + pips further really.) – but more importantly the longer term / bigger picture. The Japanese have more or less “sealed the deal” with respect to becoming the lowest yielding currency of the majors – and in turn will likely see massive selling brought on by the “newly re implemented Carry trade” – please google it. For a time investors may have had question that indeed the U.S would grab this position – but now we have clarity, as it will be ineviatable for the U.S to raise interest rates before Japan ever will. So….one giant piece of the puzzle out of the way. Next. The long term suggests that a complete and total trend change in JPY pairs has / will occur (based on the selling pressures of the Carry trade) and will provide massive trade opportunities moving forward. The timing of this move/change in fundamentals out of Japan will have most certainly diverted funds / interests as the big money starts to move in / build postions etc and would have most certainly thrown a wrench into the U.S debasement game. I expect the USD is on deck next…for it’s “next leg down”….but unfortunatley for “Uncle Ben” – the rest of the world is not going to just sit idle and watch the U.S run away with the devaluation of their holdings or the fight to improve exports. Japan has far more flexibility to continue “easing forever” as their public debt is primarily held by their own citizens, and a default is next to impossible. Where as the good ol “U S of A” – will soon need to pay the piper as 57% of their massive debt is foreign owned. The implications of a default are enourmous – as well – holders of the debt can’t be pleased seeing their US dollar denominated assets…goin down in flames. Thanks for the thorough summary, Kong. Any currency surprises from the BOE and the ECB, January 10? I see you discussed the CCI above. Do you maintain or plan any commodity exposure? I’ve been riding KOL, SLX, and PHYS (the latter to disppointment). A donde vives en Mexico? Yo vivo en Playa Del Carmen! I don’t expect anything as a surprise no. Both the EUR and GBP have made considerable dips against USD.I don’t trade these much – but all said may look to get long both against USD – when the damn thing finally rolls over. Commodity wise – Im torn, and also curious as to how things unfold.In “not knowing” I will likely sit this one out until a clear and “stable” trend has been identified. Longer term I want to “get in big time” – I like some of the junior miners as well have firm belief in the long term Pm’s story. Considering the number of trade opportunities available – I’m not rushing anything. Im long USD/JPY too Schmed – but barely…as its gettin pretty late in the game here short term. It’s got miles to go in the long run as likely one of the best trades of the coming year – but we are pushing at the upper end here. Just careful that’s all. Im still long AUD and NZD vs JPY – as well been in and out of EUR/JPY for some awesome gains. I’ll see have the next several hours go…. I am also long AUD/USD and EUR/JPY….and well in profit in both.